Any clash between Celtic and Rangers is going to be fiery, feisty and more likely going to see the officials have a busy day. The venom that exists between the two clubs and their supporters has made its way onto the pitch and you can expect to see the Hoops and Gers stars going toe to toe to seal an all important derby day win. One man who has got to keep his wits about him is Alfredo Morelos, the Colombian quickly building up a reputation as being a hot head who cannot control his temper – his disciplinary record doing little to sway opinions from that verdict. However, teammate Daniel Candeias has insisted it is not the Light Blues striker who is the problem but the opposition players who rile him up – but has he made a blunder lifting the lid on how to get the better of him? He told the Daily Express: “People say Alfredo has too many red cards, but in all the games the players provoke Alfredo. Surely that is Celtic’s game plan all wrapped up for them? Yes, Morelos has not scored against Celtic in Scotland yet but there is no doubting that he is the most dangerous threat Steven Gerrard’s side possess and keeping him quiet is a must. Or should that be ensuring he is not quiet? The one thing better than playing against a side with a silenced striker is playing against 10 men and if the Celtic players can get Morelos’ anger to bubble over then it should make the Bhoys’ life a lot easier. 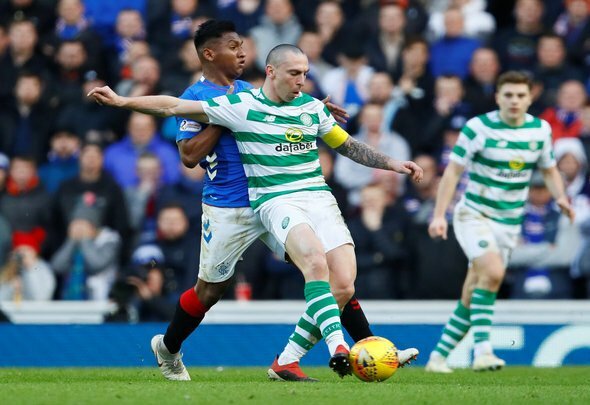 Scott Brown is a master at provoking reactions and maybe the midfield maestro should be sent out purely to get the better of the Rangers star both physically and mentally. Candeias’ defence of Morelos seems a mistake and has only given their fierce rivals an advantage when they meet after the international break – the Colombian will surely have to keep a lid on his rage more than usual.